Creating your own reality through the manifestation process is so incredibly powerful. I have been the beneficiary of this consciousness. I know that manifestation of your dreams or your own magic must be coupled with a willingness to surrender to the universe or divine so that the life you love and desire can come to light. Sometimes, the manifestation process also contemplates periods of profound darkness as well. All opportunities to learn the life lessons that empower positive change and growth. From the wound, we have the opportunity to heal in such a major way that can course correct our world to greater light and enlightenment. It is during the darkest times that provide the fertile ground for periods of growth as we challenge ourselves to grab on to our inner light and share it with others. Persistence is the key. A never quit attitude is what sustains us. And faith defined as trust and loyalty invested in love will bring us home to where we want to be once again. It is a journey. The ebbs and flows, the ups and downs, the highs and lows- all a part of the life process. Just as surely as the onset of pain, there are gifts that can come from the chance to recalibrate and reset to arrive to a more loving place. I have not been able to sit down with these thoughts because the pain of growth can be too much, but with the release, negative energy does eventually pass through me as my manifestation of the beauty in this world draws closer and closer. Finally arriving to a place where I can feel whole once again where the miracles lie. 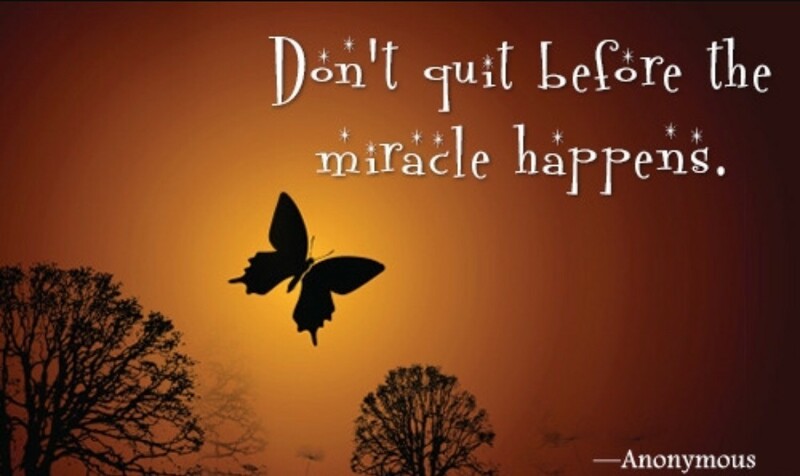 Don’t quit before the miracles happen. Consistently keep the faith!